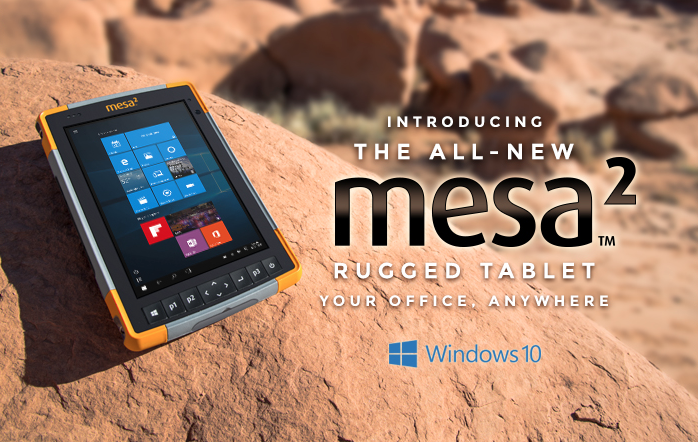 Introducing…the New Mesa 2 Rugged Tablet! We are happy to announce the all-new Mesa 2 Rugged Tablet—the ultimate tool for data collection. Running the new, powerful Windows 10, the Mesa 2 was designed to boost productivity throughout every stage of the data collection process, from start to finish. Built ultra-rugged to withstand any environmental conditions, the Mesa 2 truly will become your office, anywhere. Congrats on what looks like a most impressive new product. Here’s how we concluded our preview of the Mesa 2: “What does the Mesa 2 mean in the larger scheme of things? Traditionally, providers of rugged mobile computing gear have either concentrated on handhelds or on laptops and other larger devices. There has been relatively little overlap. However, things are changing, what with handhelds, driven by smartphone trends, getting ever larger, and tablets coming in all sizes. Then there’s Microsoft’s Windows 10 “Universal Application” software platform with a common Windows core, essentially obliterating the software differentiation between handheld and larger devices. Thanks a lot for your information and review post. Can you tell me which rugged tablets is good?